Interestingly, the serial number is also stamped on a wooden piece underneath the machine, and the number “4” is stamped onto a metal piece on the carriage assembly. The decorative elements on the front of the machine appear to be hand-painted. See photos section below. Figure 1. Engraving original type. Click to enlarge. 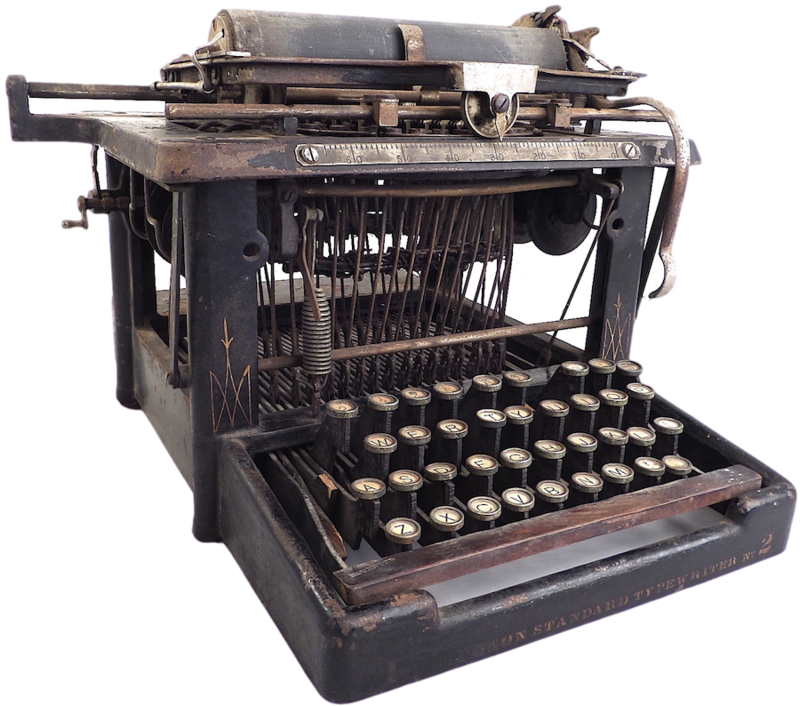 The advantages gained by the employment of the typewriter are so numerous and so important as to excite wonder as to why the machine was not invented and perfected centuries ago, instead of being one of the most recent products of inventive genius. He lists several areas of improvement: accuracy, rapidity, “facility of learning to write,” and duplication of work — essentially anticipating the computer, which not only increased our output, but also our intellectual capacity. Some might wince at this last point, but there is no questioning that computers have become extensions of our intellectual selves. What computers are today, the typewriter was to society yesterday. 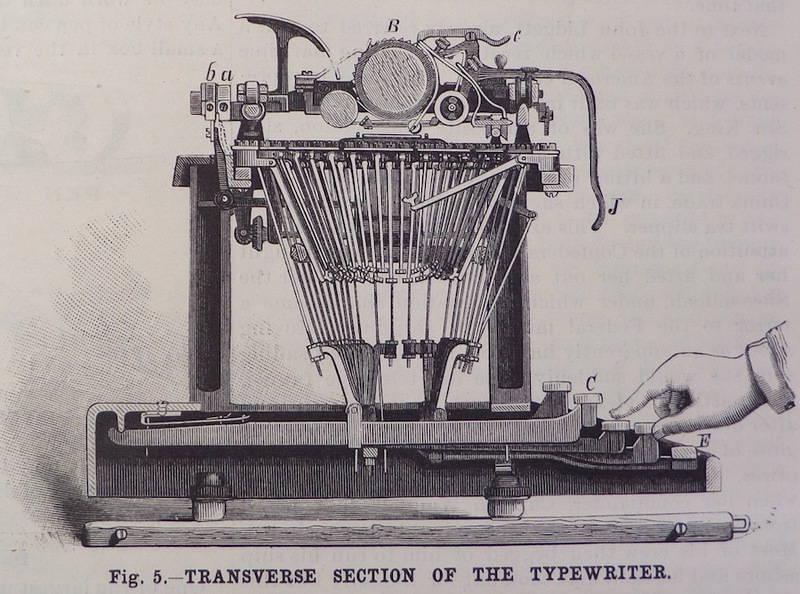 The typewriter was an integral part of today’s digital revolution. Figure 3. Annealing, tempering and bluing. Click to enlarge. Note: This article was published Dec. 15, 1888 on pages 374-375. 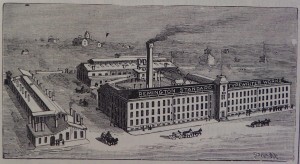 The cover of the periodical was also dedicated to the Remington Typewriter Company. The words “typewriter” and “keyboard” are often spelled as two words. All images from the article are presented in the photos section below, though some are interspersed throughout. Additional note: I’ve posted scans of this article here. With almost periodic regularity there appear from time to time great inventions which form the bases of new industries, or greatly modify those already existing. They often affect wide ranges of business interests, frequently producing marked changes in the manners and customs of people. Such inventions were the steam engine, the reaper, the sewing machine, telegraph, telephone, and dynamo. Another invention, none the less deserving of a high position among important modern inventions, is the typewriter. Its earlier development, like that of the steam engine and many other leading inventions, was not rapid, but by gradual improvement it has been perfected to a high degree, both in principle and construction. The Remington typewriter factory. Click to enlarge. The typewriter is becoming as indispensable in business and for private use as is the sewing machine in manufacturing and domestic uses. The advantages gained by the employment of the typewriter are so numerous and so important as to excite wonder as to why the machine was not invented and perfected centuries ago, instead of being one of the most recent products of inventive genius. Among these advantages the foremost is, perhaps, that of accuracy. There is no cover of crooked lines and ink blotches under which to conceal poor spelling and bad punctuation. Every character is positive. It stands for itself and cannot be mistaken for anything else. Another advantage, which is no less important than that of accuracy, is that of rapidity. It needs no argument to prove that 1 is less than 4 or 7. Every character made by the typewriter is the result of a single stroke of the finger, whereas the simplest written characters require several movements. Another advantage is the facility of learning to write. In ordinary hand writing the student may be correct in spelling and in the use of capitals, and accurate in punctuation, yet never be able with any amount of practice to produce a legible or presentable manuscript. With the typewriter, all rules for the formation of letters and characters may be ignored, and all of the toilsome practice required to produce a copyist’s hand may be avoided. Still another advantage is that of producing manuscript in duplicate. It is often of great importance to provide exact copies; nothing is easier than to accomplish this by means of the typewriter. From four to twenty legible impressions which are exact duplicates may be made simultaneously. Figure 2. Case making. Click to enlarge. It is about as difficult to tell who invented the typewriter as to name the inventors of the locomotive. The typewriter in its present state is the result of the efforts of many inventors. The fundamental invention which underlies the construction the type writer most largely in use was due to Mr. A.E. Beach, one of the proprietors of this journal. 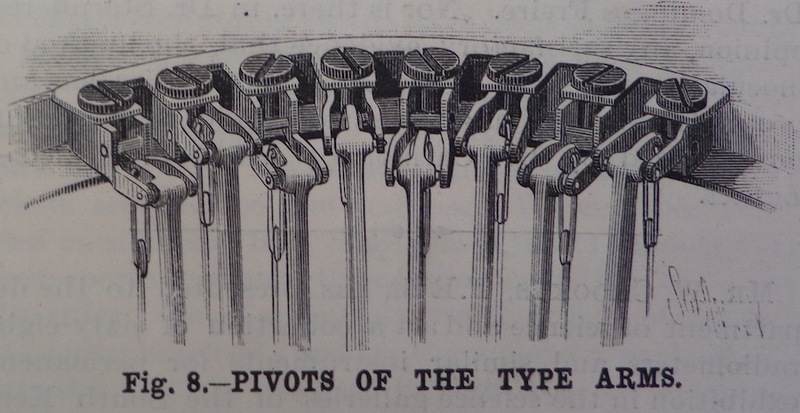 The principal feature of his invention was the arrangement of the radical swinging arms, carrying at their free ends the types for producing the impressions. 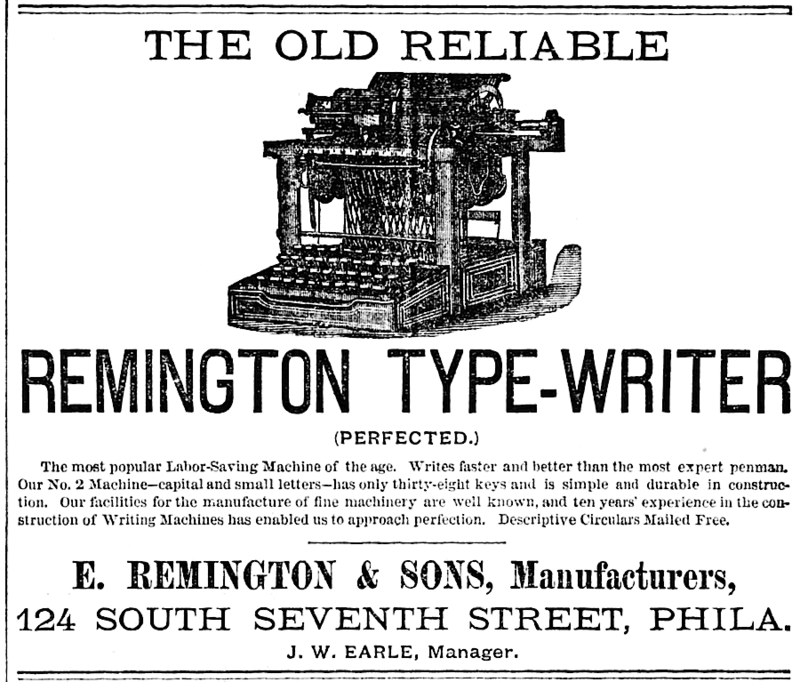 Mr. C. Lathom Sholes, of Milwaukee, was the principal inventor of the first Remington typewriter. We cannot enter in to the detail of all the improvements that have been made in the typewriter, but will point out in a general way the main features of construction and describe briefly the manufacture of the Remington typewriter, which has been so successfully perfected and introduced under the management of the well known firm of Wyckoff, Seamans & Benedict, of 327 Broadway, New York. 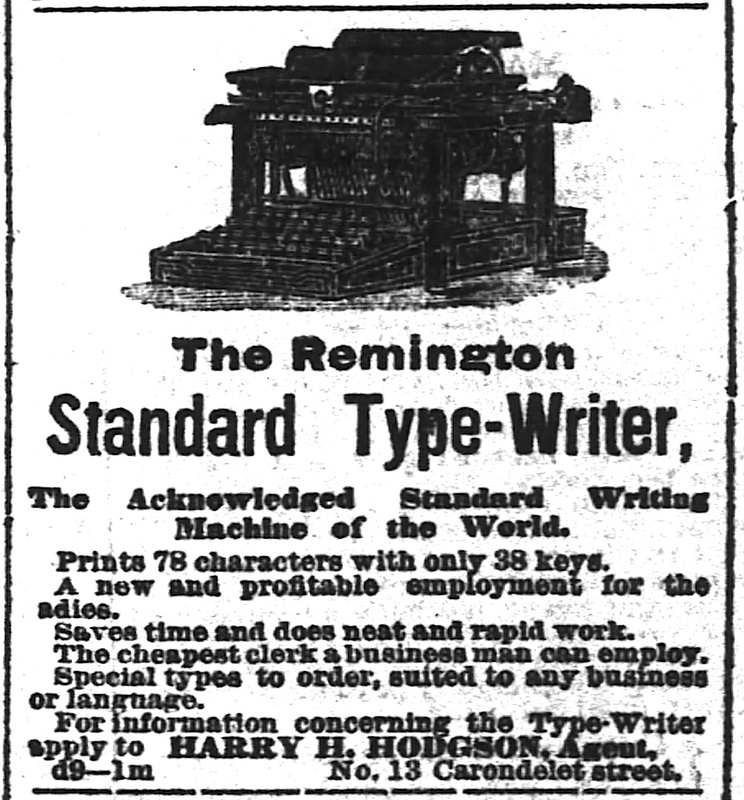 The Remington typewriter, formerly made by E. Remington & Sons at Ilion, New York, is now made at the same place by the Remington Standard Typewriter Manufacturing Company, a company organized by Messrs. Wyckoff, Seamans & Benedict and others some two and a half years ago, and by whom, at that time, the business machinery, tools and franchises of the typewriter were purchased from the Messrs. Remington. One of our engravings presents a bird’s eye view of the Remington works; the other views show the construction of the machine and several of the operations concerned in its manufacture. Figure 5. Transverse section of the typewriter. Click to enlarge. Fig. 5 is a vertical transverse section of the No. 3 machine, showing the arrangement of the keys, key levers, and connections. In the upper part of the main frame of the machine is arranged in a ring to which are clamped loops in which are pivoted the type arms. These loops are arranged in two series, one above the other, to economize space. There are in these machines as ordinarily constructed from 38 to 42 of these type arms, each one bearing at its free extremity a die having on its face two characters, generally an upper and a lower case type, but some of them bear other characters; for example, figures and punctuation marks. The type arms are pivoted relative to the ring so that the characters which they bear all strike exactly in the same place. The type arms have hardened steel pivots which are ground to a bearing, thereby insuring accuracy in the movement of the lever, and at the same time increasing their durability. As shown in Fig. 5, each type arm is connected by an adjustable steel wire connector with the key lever pivoted at the back of the machine and projecting beyond the front, where it is curved upwardly and provide with a finger piece or key bearing the character or characters represented by the type arm with which the key lever is connected. By using two characters on each type arm, and by a very ingenious arrangement of the paper carriage, the necessity for separate keys for capitals and small letters is avoided, one key being made to serve for two letters or characters. Figure 6. Carriage shifting mechanism. Click to enlarge. The mechanism by which this is effected is show in Fig. 6. 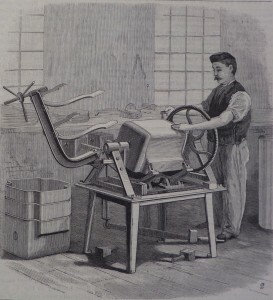 The paper-supporting roller is journaled in a frame which is capable of moving transversely on the paper carriage the distance required to shift the paper from the lower case letter to the capital upon the type arm. The end of the type arm and the double type carried thereby is show in detail at A, and the paper-supporting roller, B, is shown in full lines above the lower case type, and in the dotted lines in its position for writing capitals. The capitalizing key, C, which is the foremost one shown in this view, is connected with a right-angled lever, D, returns the roller to its normal position as soon as the finger is removed from the capitalizing key. In this view (Fig. 6) is also shown the feeding and spacing mechanism. The space bar, E, extends entirely across the front of the key board, and a bar, F, which is supported by rods, G, from levers, H, extends under all of the key levers, including the levers attached to the space bar. The levers, H, support the ratchet bar, I, which acts upon the pallets, a, b, in alternation, allowing the spring attached to the paper carriage to move forward one space at a time, as the pallets, a, b, escape from the teeth of the ratchet bar, I. It will be observed that whenever a key is depressed to print a character upon the paper carried by the roller ,B, the bar, F, will be moved down and the rack bar, I, shifted from the pallet, b, to pallet, a. This is done without any movement of the carriage; but when the key is released and the rack bar, I, returns to its position on the pallet, b, it allows the paper carriage to move forward one notch. If a greater space is desired than the normal action of the machine provides, the space bar, E, alone is operated. In the No. 3 machine for wide paper, which is the machine selected for our illustrations, the paper carriage moves freely, being supported by three rollers, two running on a cylindrical rod at the back of the machine and the third one running on a V-shaped track at the front of the machine. 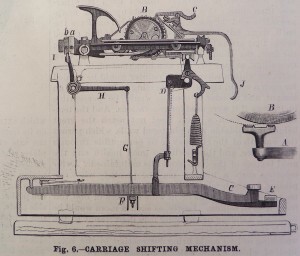 The carriage may be readily lifted to inspect the work by means of a carriage handle extending over the frame of the machine at the left, above the key board. 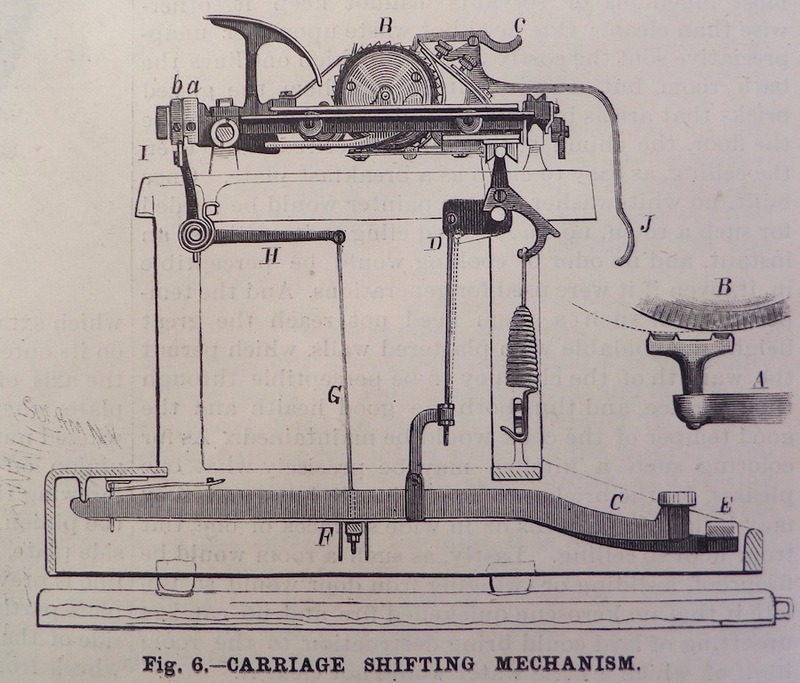 When the carriage is returned to write a new line, the raising of the lever, J. brings the pawl, c, into engagement with the ratchet on the roller, B, thereby moving the paper carried by the roller forward a distance equal to the space between the letters. The carriage is provided with a simple adjustment, by means of which the space may be varied according to the requirements of the work. Figure 10. Centering the type arms. Click to enlarge. In Fig. 10 is illustrated the operation of centering the type arms. An arm carrying a pin corresponding in form to the shank of the double type is supported above the ring carrying the type arms, the pin being located exactly in the center of the ring. Each lever is adjusted so that the aperture in its free extremity which receives the double type fits upon the pin. The types are adjusted in the ends of the arms in a similar way. In Fig. 1 is represented the department in which the dies for making the steel types are designed and made. Great skill and much patient labor is required in the making of these dies, but when once made they are capable of producing a large number of types. Types are here formed for nearly every written language. For the Chinese no type writer has been constructed. As thirty thousand characters are employed in expressing this language, it is obviously impossible to adapt the type writer to such a large number of characters. In Fig. 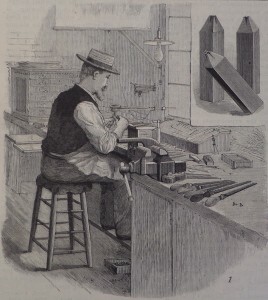 3 is shown the department for tempering, annealing, and bluing. The types used in the type writer are made of steel, tempered and hardened like wood- or iron-working tools. 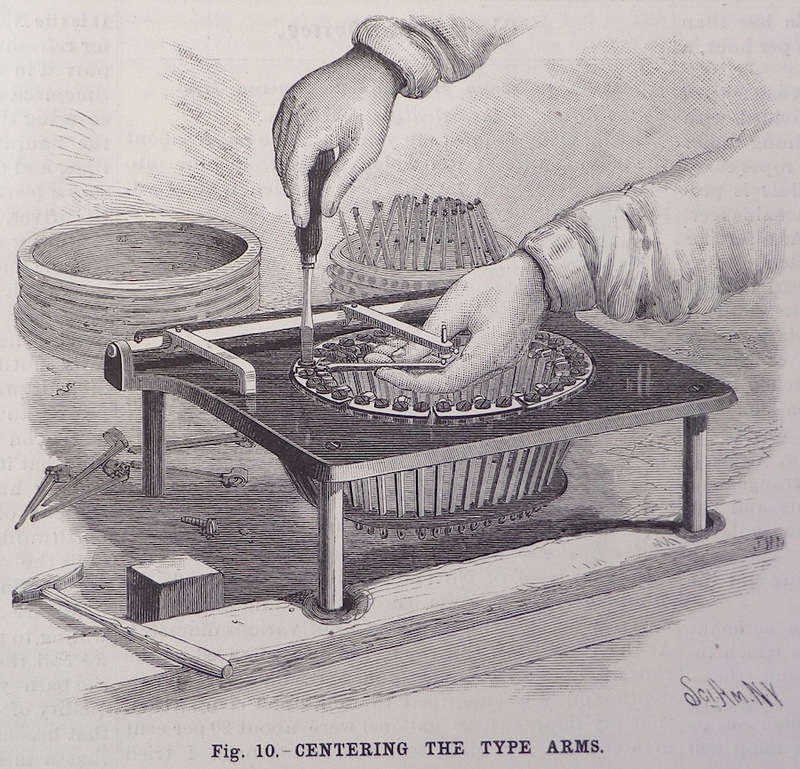 The workman takes a quantity of types, heats them to the proper temperature, and plunges them into a vat containing a mixture capable of giving them the required degree of hardness. To facilitate the operation of separating the types from the mixture contained in the vat, the vat is composed of an inner and outer portion, the inner portion being a sieve of sufficient fineness to retain the types while allowing the mixture to flow out as the sieve is raised. Adjoining the type-hardening fire is the bluing furnace, in which the steel parts not otherwise protected against oxidation are blued. This operation is performed with unformity and great rapidity by placing the screws and small parts in sand, and heating the whole until the required color appears, the sand bath being agitated to cause the heat to be uniformly distributed over the contents of the heating vessel. When the bluing operation is completed, the screws and other small parts together with the sand are emptied into a sieve which allows the sand to pass through while it retains the steel parts. 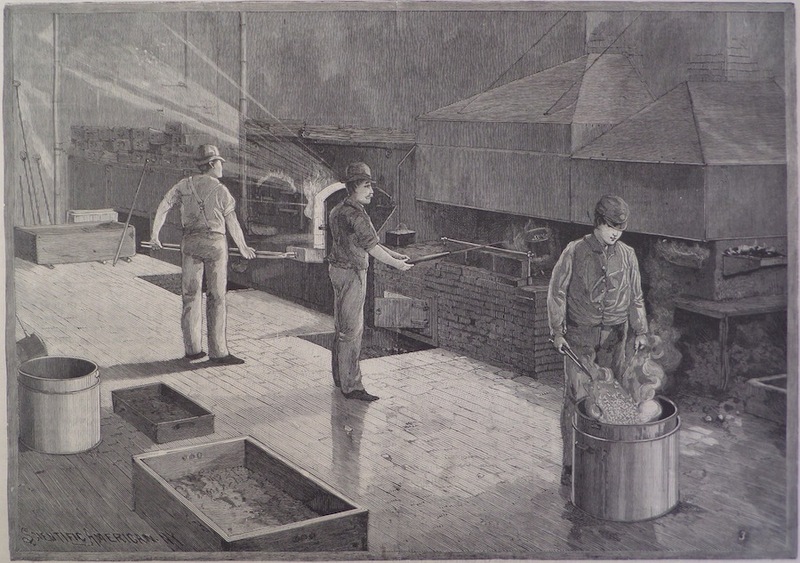 Adjoining the bluing furnace is the annealing furnace, where the types and other steel parts are softened preparatory to forcing them into dies which give them their form, before hardening. In Fig. 2 is show a machine in which the covers for protecting the machines are formed. In this ingenious machine the covers are quickly formed from sheet metal. Figure 8. 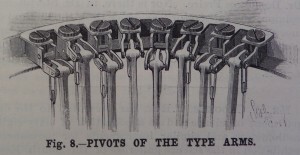 Pivots of the type arms. Click to enlarge. In addition to the various operations which we have briefly described, there are necessarily many other s which go toward the completion of the machine; for example, many of the parts are nickel plated, others are japanned and nicely ornamented; many of the parts are drop-forged. The key levers are of wood ingeniously re-enforced to secure strength with a minimum of weight. All parts require special machinery to secure uniformity and perfection in their construction, which it is perhaps unnecessary to describe in this connection. The type writer takes rank as one of the principal inventions of the age. In almost every office in every large city may be found one or more of these now indispensable machines. The Scientific American makes use of these machines in its editorial work, in its correspondence, and in its patent business. By its use, business has been greatly facilitated in these departments, and at the same time uniformity and accuracy have been secured. Besides the benefits derived from the use of the type writer in business by individuals and large houses, this useful machine has furnished profitable and pleasant employment for thousands of men and women who might otherwise have been engaged in harder work at lower wages. It has proved a great educator, elevating the standard of letter and manuscript writing, often effecting the combination, in one person, of author, compositor, printer, and proof reader. “Capital and small letters” — The Times – Philadelphia, Pennsylvania – May 20, 1882. The Times-Picayune – New Orleans, Louisiana – Jan 1, 1885. The Times-Picayune – New Orleans, Louisiana – Jan 6, 1885. Right-click on images to view in their full glory. You can download a zip file of these photos here (right-click and select target). 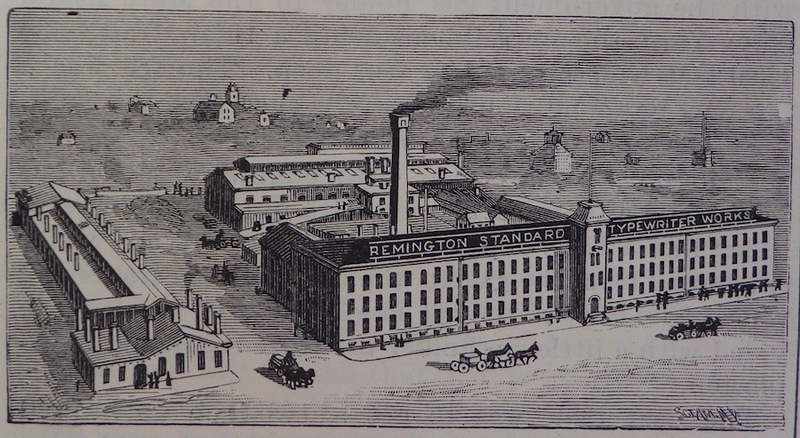 Remington Standard No. 2: “Lower Case” vs. “Shift Key”? — was lower case the default mode for early Remingtons? We have a Remington typewriter desk that looks like it has a patent from 1889. Do you know what these desks go for? Any ideas on anyone who might be interested in it? The weight is gone but it has the cables and pulleys. The desk seems to have a serial number of 25430. Thanks for any info you can provide. I have a Remington American Standard #2 The date stamped on the underside a 1-29-1901 A-1. The serial number is 31740. These numbers don’t seem to jive. Do you think this is correct. The number 31740 appears to make it manufactured in the late 1800’s, not 1901. Can you give me any info? 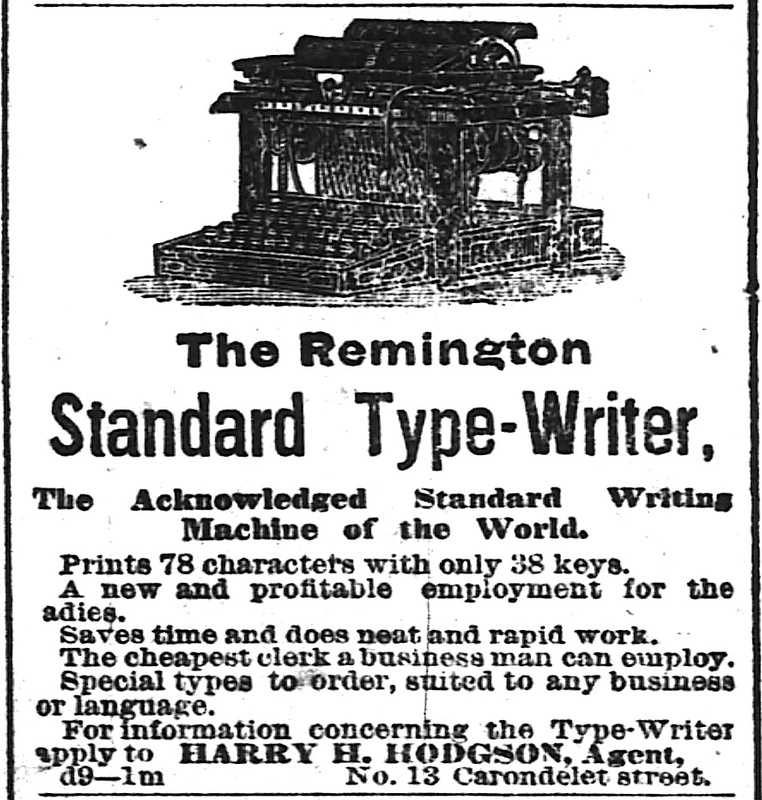 Next post: Remington Standard No. 2: “Lower Case” vs. “Shift Key”?